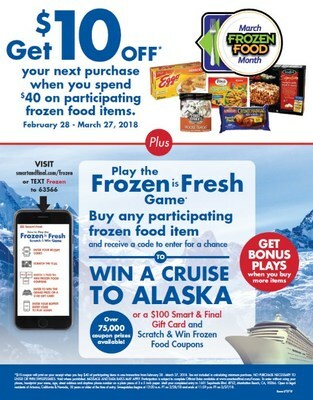 COMMERCE, Calif., Feb. 28, 2018 /PRNewswire/ -- Smart & Final Stores, Inc. (NYSE: SFS), the value-oriented food and everyday staples retailer for household and business customers, will celebrate national Frozen Food Month with a special in-store promotion and sweepstakes to give away several prizes, including one Alaskan cruise and 28 $100 Smart & Final Gift Cards. Customers can enter the "Frozen is Fresh" sweepstakes from February 28 through March 27, 2018 by navigating online to the "Frozen is Fresh by Smart & Final" game website at www.smartandfinal.com/frozen or texting 'Frozen' to 63566, after purchasing a participating frozen food item and receiving an entry code on their receipt. Once the code is scanned on the website, it will unlock a Scratch & Win game to play and enter. Participants can also play the brand's second annual online scratcher game for a chance to win frozen food coupons. Every purchase of a participating frozen food item will provide an entry code to the sweepstakes and the scratcher game. Smart & Final expects to give out over 75,000 coupon prizes, ranging from $1 to $4 off. Customers can earn bonus codes for more chances to play the game by buying more items! "National Frozen Food Month is a unique opportunity each year to remind customers of the versatility, value and freshness of frozen foods," said Joe VanDette, Vice President of Marketing, Smart & Final. "Our in-store promotion and online sweepstakes is a fun way to introduce a variety of frozen foods that can help Smart & Final customers save time and money on meals, without sacrificing taste and quality." In addition to the sweepstakes, any customer who purchases $40 or more of select frozen food items during the promotion will receive a $10 coupon valid on their next purchase at any Smart & Final location. Limit one coupon per transaction. $10 coupon will print on your receipt when you buy $40 of participating items in one transaction from February 28 - March 27, 2018. Tax not included in calculating minimum purchase. NO PURCHASE NECESSARY TO ENTER OR WIN SWEEPSTAKES. Void where prohibited. MESSAGE AND DATA RATES MAY APPLY. Participation is subject to complete Official Rules available at www.smartandfinal.com/Frozen. To enter without using your phone, handprint your name, age, street address and daytime phone number on a plain piece of 3 x 5-inch paper. Mail your completed entry to 1601 Sepulveda Blvd. #752, Manhattan Beach, CA, 90266. Open to legal residents of Arizona, California & Nevada, 18 years or older at the time of entry. Sweepstakes begins at 12:00 a.m. PT on 2/28/18 and ends at 11:59 p.m. PT on 3/27/18.